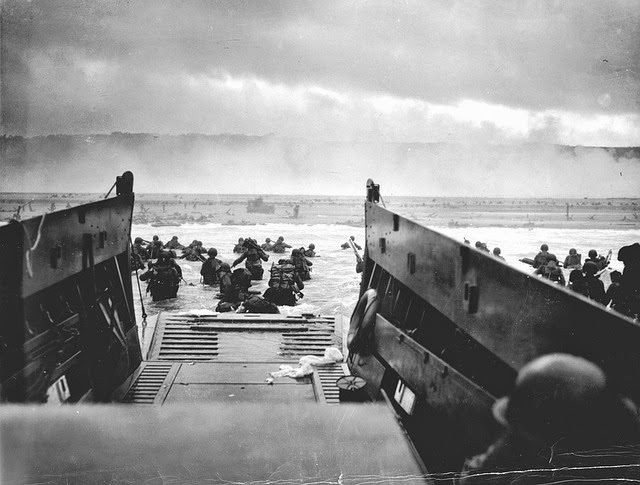 Today on the 70th anniversary of the D-Day landings I am thinking of all the brave men and women who were involved in the day that was to have a huge impact on our lives today. 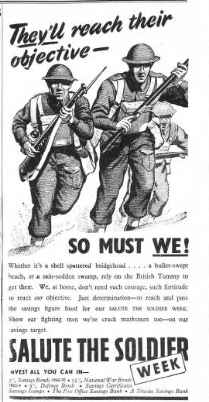 I am sure that everyone of us has pondered on the sheer scale of the day as it played out, the scene that would be witnessed on the beaches of France on 6th June 1944 was a far cry from the picture that appears in our minds today when the word "beach" is mentioned. The modern media showing photos, video footage and telling the veterans stories all allow us to listen in awe as to how brave these men and women were. 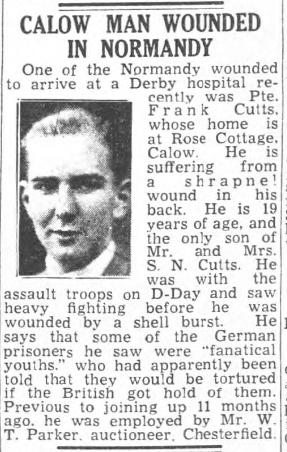 The D-Day landings were reported in the local newspaper the Derbyshire Times. 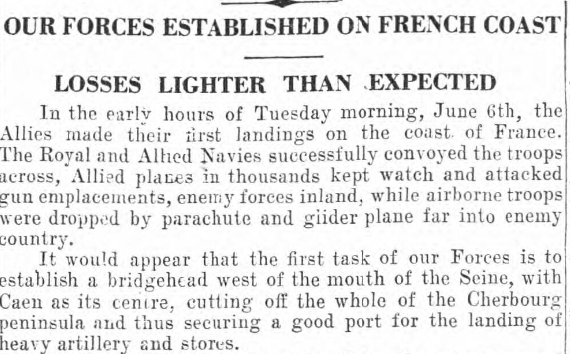 Our ancestors would read the front page just a few days after the landings and be told "our forces established on French coast" "losses lighter than expected". The locals must have been over joyed, a turn in the tide of the second World War. Could this be the way to the end of this terrible war? Would our husbands, son's and daughters soon be home safe and sound? Would the rationing and air raids be at an end? All of the local Churches in Chesterfield and around the country were opened for silent prayer of thanks and services were held to pray for the safe return of the brave soldiers. 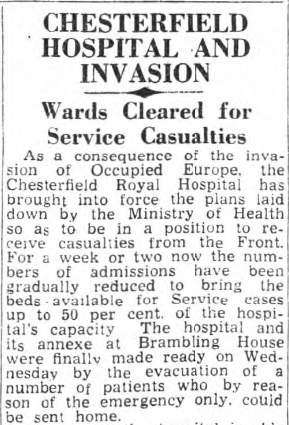 I was surprised to read that the Royal Hospital in Chesterfield was ordered to reduce it's inpatients in expectation of their being large numbers of wounded who would be transported to this hospital after the invasion. Chesterfield is one of the most in-land towns in England, this is why I was surprised to hear that wounded soldiers would be sent such a distance from the coast to this small market town for treatment. 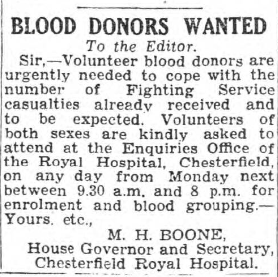 In fact it was reported that over 150 men were being treated at Chesterfield Royal Hospital the following week. They arrived by road in ambulances and converted buses from the base hospitals in nearby Nottingham, the first 20 men on Sunday evening 11th June, over 80 men on Monday afternoon 12th June and the remainder more than 40 men on Tuesday 13th June. It didn't take long for the news of the Royal Hospital's heroic patients to spread around the town and the Chesterfield inhabitants were soon assembled as a large crowd to applaud and cheer their brave soldiers. The men were reported as being a "cheerful crowd of men" although their uniforms were soiled they were in good spirits. It appeared that the majority of these men had been wounded by sniper fire in the opening hours of the invasion. The fact that so many had gun shot wounds to the arms was causing great amusement, the men joking about the lack of skill the German marksmen had in the accuracy of their shot. One young lad of around 20 years old had his bullet removed from the side of his torso, he was said to have been looking forward to returning the bullet to its owners; the Germans. Two of the men were local men; Lance Corporal Fred Gibbions of Heaton Street and Sergeant Samuel George Evans of Rooths Row, Barker Lane. 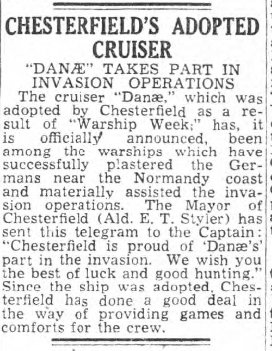 Chesterfield had another hero of the D-Day landings; a warship named Danae which the locals had "adopted" during "warship week". HMS Danae was a D class cruiser (1), she took part in Operation Neptune. Her part in the battle can be read here. Bernard was only 18 years old, he was the son of Mr and Mrs W.E Harvey of 21 St Augustines Avenue, Chesterfield. He told how he was a gunner on his vessel along with two other Derbyshire boys, one being "Toby" from Clay Cross. The war ship had taken a quiet passage onto the northern coast of France, the silence only being broken by the singing of the "Tommies". Bernard and his comrades were in the first wave of troops to enter the invasion of the Normandy beaches. The role of Bernard's vessel was to chaperone the troop ships to Cherbourg, the R.A.F being on watch from the skies. They were hit by enemy aircraft, but luckily for Bernard and his fellow men the plane was shot down before any further harm could be done. 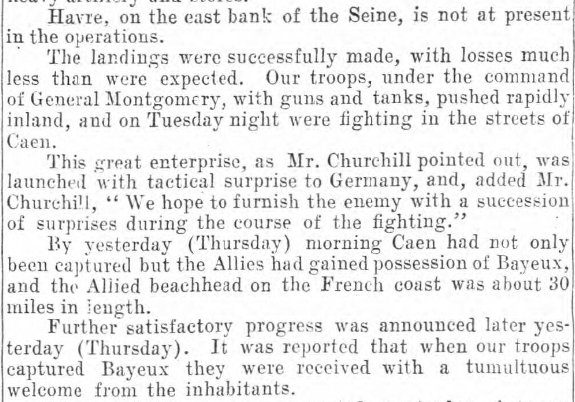 The day afterwards the war ship returned to the English coast to collect more troops, the following day they were back at Cherbourg dropping them off. Bernard told how the ship was spotted by an E Boat, but they rammed the smaller vessel and in his words the vessel "was done for". Bernard had joined the Royal Navy in 1943, prior to that he worked for the L.M.S railway. He was also a Leading Seaman for the Chesterfield Sea Cadets which he had been a member of since he was 13 years old. Dennis was the son of Mrs Alice Davison of 79 Park Road, Boythorpe, Chesterfield. 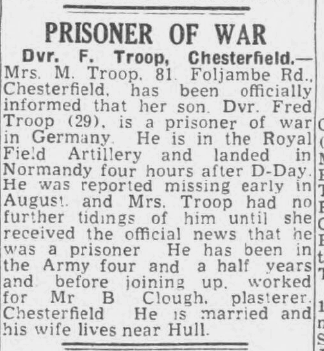 Poor Mrs Davison had no idea that her son was involved in the D-Day landings, it was only after some weeks that she began to become anxious after not communicating with him. Dennis had been heavily involved in the invasion and his story is one of true courage. Dennis and his comrades were engaged in holding a bridge when he became estranged from the rest of his unit. He was alone and saw a German sniper, as he was about to try to take the sniper he was "pounced on by a German squad". Dennis described then as "hefty blighters". They took his tunic and told him to remove his trousers also. Dennis was not to be easily commandeered and so he made a run for it, in his words he "managed to give them the slip". The German's did search for Dennis and general gun fire was fired around at random, but alas a shell fell near to Dennis and wounded him in the arm and the leg. He was in hiding for 2 days until he came across the Royal Field Artillery unit who provided him with bandages and led him to safety. Dennis who was reunited with his mother for leave had previously served with the local regiment of the Sherwood Foresters. Prior to the war he had worked as an engineers fitter for Sheepbridge Stokes and Holloway Brothers outcast coal company. Charles was aged 19 years old, the son of Mr and Mrs G Kelley of 42 Compton Street, Chesterfield. Charles was one of the first wave of the invasion and their landing craft managed to negotiate the underwater obstacles and the mines. The craft was however struck by a shell and so along with the sniper fire some of the men were wounded. Charles was hit by a snipers bullet which shattered his right arm and he was being treated at the Royal Hospital in Sheffield. He described how they had the objectives to reach a radio location unit, passing along pill boxes and slit trenches along the way. They did well until they reached the radio box which was made of concrete. Charles told of the female snipers who were almost fanatical for the German honour. He said that the caused many injuries amongst the allies and that when they were captured they would chant "Heil Hitler" and "Heil the Reich". Prior to the war Charles was employed by Messrs Pearson's Potteries on Whittington Moor, Chesterfield. Alfred Head aged 29 years old lived with his wife at his home at Summerfield House, Park Road, Chesterfield. 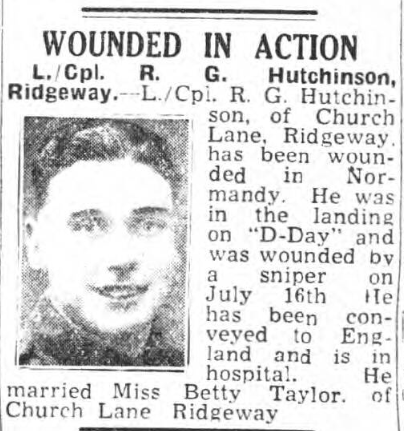 He was killed in action in Normandy after the invasion on 11th June 1944. Alfred had a wide range of military experience, having fought in the Middle East and joined up in 1940 with the 6th Battalion Home Guards. Alfred was the son of Mr and Mrs A J Head of Bedford, he had schooled at Dulwich College and came to Chesterfield in 1938. He spoke French and German fluently and was passionate about literature and music. Chesterfield had a large population of Irish immigrants, my ancestor’s included. Many of the families lived in an area known as the “Dog Kennels”. This was an area of terraced street's at the back of Low Pavement in the centre of Chesterfield. 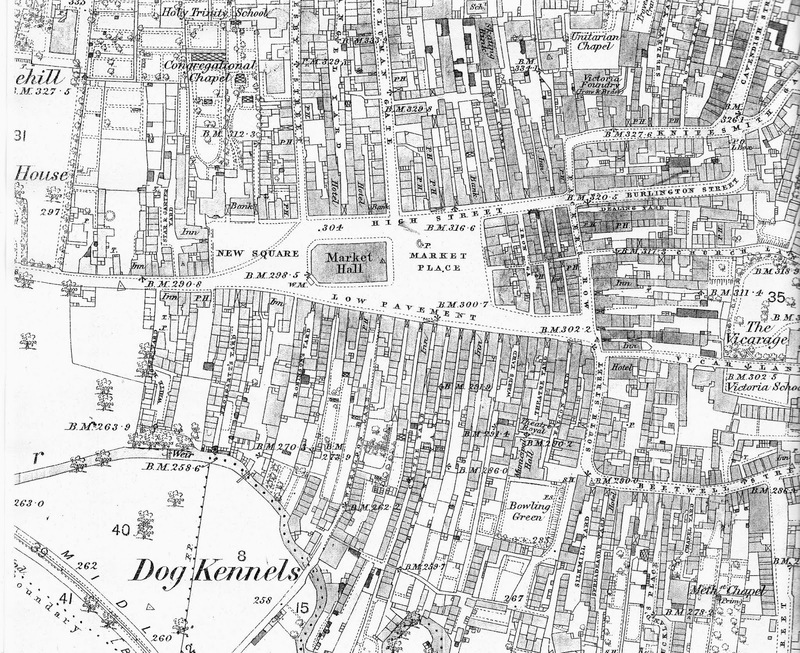 The name, although apt for the area of slums was actually taken from its original use - as "subscription dog kennels". The streets became home for many unsavoury characters, the crime rate was high and so when the poor Irish immigrants found themselves resident in Chesterfield the "dog Kennels" were probably the only houses that they could afford to rent. Some lucky Irish however were scattered around the town, for example Irish shoemakers congregated on Glumangate at the other side of the town. *James Callaghan and his wife Bridget; both aged 40 years old and born in Co Sligo. James worked as a general labourer. *John Dignan a 35 year old miner lodged at the house with his wife Mary both also born in Co Sligo. They had a 3 year old daughter named Mary; she was born in Co Roscommon. *James Kelly a 40 year old hawker and his wife Mary aged 33 years old. James was from Co Sligo and Mary from Co Kildare. *Matthew Marrison a 27 year old miner, James King aged 28 years old, Peter Mahan aged 26 years old and Mary Mahan aged 28 years old all also originated from Co Sligo. The Irish were often in the local newspapers for their rowdy antics; most often for drunkenness and fighting. The fighting was not unique to the Irish men though; the 2nd November 1861 issue of the Derbyshire Times tells of the trial of Cicely Granger and Winney Varney. Cicely and Winney had been harbouring ill feelings towards each other for a while. They were neighbours; Cicely lived in Hollands Yard. She was aged 44 years old and from Tuam, Co Galway. Cicely is recorded on the 1861 census as Cecilia; she was married to William Granger. It appears that on the day in question Cicely had called on Winney and challenged her to a fight. Winney had on her person a large sand hammer, which she had hidden from Cicely under her apron. On receiving the challenge to fight she struck Cicely on the head and caused her serious injury. There were many witnesses to the incident, telling how Winney had been drinking earlier. In conclusion of the trial the magistrate was left unable to decide which of the two “ladies” was the worst and duly dismissed the case. This was not the end of the argument however, as family loyalties were high, Mary Granger the daughter of Cicely caught up with Winney a few days later. This once more resulted in a row, which led to a fight between the two ladies. Once more the magistrate dismissed the case. Many of the Irish menfolk worked at the coal mines around the Chesterfield area. The train taking the miners to work was nick named the “Paddy Mall” and would transport the men to and from the mines for a small fee which was paid on a fortnightly basis. Often the men were found to have been travelling without a ticket. Various excuses would be given and promises of better behaviour next time. The Irish miners were said to have been more likely to spend their hard earned wages on beer and gambling than a train ticket (well this is what I have been told in relation to my 3 x Great Grandfather anyway!). In November 1894 the body of an Irish labourer named John Hannan was found drowned in the Chesterfield Canal. John was last seen when he left his home in Shakespears Yard to board the “mall” which left from “the wooden bridge about 100 yards from the station”. It went to Staveley Town, where John worked for Messrs. Logan and Hemmingway on the steam navvy. When John did not come home that evening his brother Patrick went around all the public houses to find him. He continued his search until 10.30pm on Wednesday night. On Saturday after hearing nothing from John he returned to the canal and found his body. A letter was found on John’s person, which was from a relative in Russeltown thanking him for money he has sent them. He also had a knife, pocket book, beads, cross and a few other small articles in his pockets. Patrick Tighe the son of Irish immigrants Thomas and Ellen Tighe served with the Notts and Derbyshire Regiment during WW1. He was a Sergeant number 241290 and then served with the Labour Corps number 403169. Patrick lost his life on 14th July 1919 aged 32 years old; he is buried in Spital Cemetery. He was awarded the British and Victory Medals for his sacrifice. Patrick was born in Chesterfield but his parents were from Ireland; Ellen born Glenamaddy, Co Galway. Patrick worked as a railway platelayer prior to WW1. Patrick had an elder brother named Lawrence, he died on 30th April 1916 at home in Chesterfield. Lawrence was also serving with the Notts and Derbyshire Regiment. He was awarded the Victory, British and 15 Star for his sacrifice. He to is buried in Spital Cemetery. As for Patrick and Lawrence Tighe; the Roman Catholic Irish who took their final breaths in Chesterfield Town would probably have been laid to rest in Spital Cemetery. A large area of the graveyard is allocated to those of the Roman Catholic faith. The grave plots vary from a few elaborate tombstones to numerous simple patches of grass with no indication of who may lay underneath. These unmarked graves were known as common graves, I have found up to five persons sharing the same grave plot. Each burial was dug at differing depths, a body buried, the grave covered. The adjacent plot would then receive the next body. Once the area had been fully utilised then the process would start again, digging a shallower grave over an already occupied grave plot. *Arthur Frederick Forse aged 67 years old who was buried on 13th December 1937. One of the few elaborate tombs in this section belongs to the Murphy family. 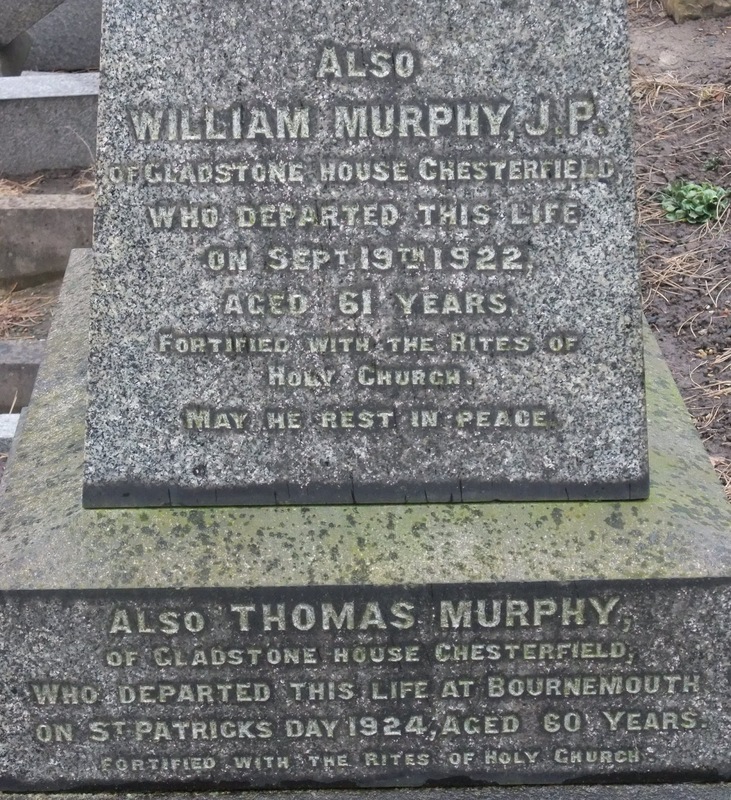 This Irish family had rose to the higher levels of society in Chesterfield. There are four members of the Murphy family mentioned on the memorial; Peter Murphy died 23rd August 1911 at Bundoran, County Donegal, Ireland, Katherine his daughter died 23rd February 1906, Thomas died St Patrick’s Day 1924 and William J.P died 9th September 1922. Looking at the census returns I found that Peter Murphy was the father of Katherine, Thomas and William. All three children were born in Chesterfield, but Peter was born in County Down, Ireland around 1828. Peter Murphy and his family lived at Gladstone House on Gladstone Road in Chesterfield. 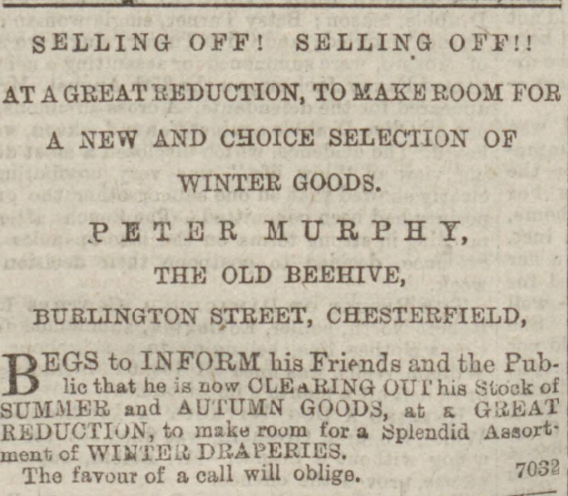 Peter ran a very successful business in Chesterfield as a draper having a retail outlet at The Old Beehive, Burlington Street. In May 1874 Peter must have set tongues wagging when he tried to sue the Rev W G Minor, curate of Chesterfield Parish Church. Peter claimed that the Rev owed him 12s for the purchase of a new vest and repairs to a coat he had carried out. The Rev Minor argued that the vest was so poorly made it required being taken apart and reassembling by another tailor, which had cost a further 4s. Rev Minor asked for an adjournment of the case to summon his witness, which was granted by the magistrate. It is not known whether Peter ever got his money from the Rev, but I would guess not. What would Peter Murphy a Roman Catholic's opinion have been on the Church Of England Curate I wonder? Peter married Miss Charlotte Irwin at the Roman Catholic Church on 14th November 1869. On his death he bequeathed £8,208 0s 10d to his two draper sons William and Thomas Murphy. Thomas Murphy had retired to the Woodleigh Tower Hotel, Bournemouth. He died there on 17th March 1924; St Patricks Day aged 60 years old. His will show’s that Thomas had accrued a remarkable sum of money; £102, 952 16s 2d. Not forgetting his home town of Chesterfield, Thomas bequeathed the grand sum of £10,000 to Chesterfield Royal Hospital in his will. The money was to be spent on a new ward to be named “Murphy Ward”. 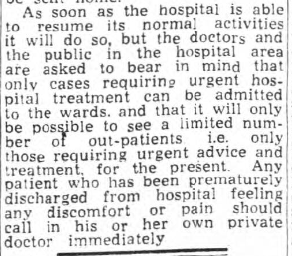 The ward was to have “all necessary provision for staff and other accommodation”. Murphy Ward still exists at Chesterfield Royal Hospital; to which we can thank Irish immigration into Chesterfield. On this St Patricks Day we should remember our Irish ancestors and the hardships they endured to make a life for themselves all around the world, if they hadn’t then I for one would not be here to tell their story.